Donald Trump's new energy adviser calls himself a climate skeptic, but he may urge the billionaire celebrity to address climbing temperatures through a hands-off government approach. Rep. Kevin Cramer (R-N.D.) said yesterday he's preparing at least two white papers on energy policy for the presumptive Republican nominee, who is scheduled to address an oil and gas conference in North Dakota later this month. Cramer, who has expressed support for a small carbon tax to replace the Clean Power Plan, said he may offer Trump advice on climate change that challenges the candidate's assertions about it being a hoax promoted by Democrats. 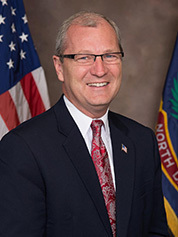 Rep. Kevin Cramer (R-N.D.) Photo by Congress, courtesy of Wikipedia. "He can do all that if he wants," Cramer said of Trump's climate position in a lengthy interview. "But my advice would be, while I'm a skeptic, as well, he is a product of political populism, and political populism believes that there needs [to be] some addressing of climate change." Trump might find that Cramer occupies gray spaces on energy and climate policy. The former utility regulator acknowledges that the world is on a path to reduce greenhouse gas emissions, but he calls himself skeptical of the broadly held view by scientists and Democrats that warming could cause severe economic and physical damage. "I've been skeptical, but I don't resist the reality that we're heading toward or our goal is a more carbon-constrained world," Cramer said. For example, he would tell Trump that the Clean Power Plan, the Obama administration's regulatory effort to decrease power plant emissions, should be rolled back. But Cramer seems to acknowledge that something else might have to take its place. "I would still tell him, 'Yeah, we need to stop and repeal the Clean Power Plan,'" Cramer said. "If in fact he wants a more carbon-restrained energy policy, he ought to work with real scientists and work with Congress to come up with a better one." But Cramer seems doubtful that can be accomplished. The prospects for undoing the climate regulation are remote if the rule survives legal challenges that appear bound for the Supreme Court, Cramer said. That would mean undertaking a new rulemaking that changes or reverses the Clean Power Plan, something that might take much of Trump's first term if he manages to win the White House, Cramer said. Instead, he said, states like North Dakota want more "urgent" action to forestall the rule. It's unclear what direction that might take, and Cramer said there's no easy advice that he could convey to his party's presumptive nominee. One idea might be a carbon tax that replaces the Clean Power Plan. Cramer is perhaps the only elected Republican to express support for such a fee (ClimateWire, Dec. 9, 2015). And his description of a carbon tax doesn't align with popular ideas about its shape. Most advocates want to direct carbon revenue toward cuts to the corporate tax rate or to fund clean energy programs. "My idea of a carbon tax would be to help fund clean fossil fuel research and development, not to fund the government, not to punish fossil fuel generation, not to manipulate fuel choice," Cramer said. "Even a neutral, a revenue-neutral, carbon tax is inappropriate, in my view. But if we can have a very, very modest carbon tax to fund, again, the solution by utilizing fossil fuels like coal, I think even the industry would support that." Cramer was one of Trump's earliest supporters in Congress. He and Trump appeared on a local radio program broadcast in North Dakota early last month in which Cramer suggested that Trump should roll back a number of energy-sector regulations during the first 100 days of his presidency. "He liked that a lot," Cramer said of Trump. That led to a meeting between Trump and Cramer about two weeks ago, when Trump was in Washington, D.C., to give a foreign policy speech. In conversations with Corey Lewandowski, Trump's campaign manager, and John Mashburn, the candidate's policy director, Cramer agreed to write at least two white papers on energy, he said. Cramer described the topics as "How does America First [Trump's campaign theme] apply to energy policy? How have regulations gotten in the way of the greatest part of our economic recovery in this country almost undeniably?" "It's easy to talk about the ways the federal government has gotten in the way," Cramer said of regulations. "But then what can we do to bring back the jobs that Hillary Clinton seems to want to get rid of in her keep-all-the-fossil-fuels-in-the-ground attitude?" Cramer said some of Trump's off-color remarks have made him "cringe." But he said that the businessman's brash style is growing on him. He sees Trump as a genuine, plain-spoken candidate. One example is Trump's assertion last week that ozone-depleting substances that were once found in hair spray don't actually hurt the environment. "Does that scare me?" Cramer said laughing. "No, it doesn't scare me, because frankly, it gets back to his blunt talk. He speaks so plainly, and yes, it may not seem sophisticated, it may not seem hyper-intellectual, but it's plain enough for everybody to understand." There's also the possibility that Cramer could become a full-time adviser to Trump -- as a Cabinet secretary. For now, Cramer is focused on getting re-elected, but he didn't deny that a higher post is attractive. "Something like that would be fine, yeah," Cramer said. Who's in line for Trump EPA boss, energy czar? Trump has room to remake energy industry, but how?